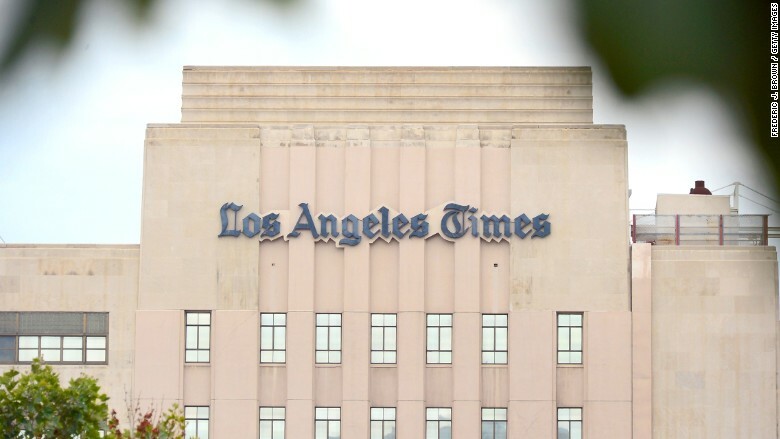 The long-anticipated staff cuts at The Los Angeles Times will begin this week and will likely target at least one-tenth of the paper's newsroom, CNNMoney has learned. On Monday, Tribune Publishing (TPUB) announced a new "Employee Voluntary Separation Program" (read: buyouts) and warned that "there may or may not be a need for additional involuntary reductions" (read: layoffs) if Tribune fails to meet its staff reduction goals. The cuts will come across Tribune Publishing, which owns the Los Angeles Times, the Chicago Tribune, the Baltimore Sun and some regional papers. But no paper is expected to be harder hit than the Times. At least 50 editorial positions are expected to be cut, whittling the Times newsroom down to fewer than 450 staffers, sources with knowledge of the situation said. In an email to staff, Tribune Publishing CEO Jack Griffin sought to console employees. "At the same time," he added, "in the challenging revenue environment that all publishing companies face, it is critical that we make hard decisions and take the necessary steps that continue to position Tribune Publishing Company for success over the long term." Tribune employees will have until October 23 to submit buyout applications. If Tribune does not meet its staff reduction goals by then, it will move to layoffs. The cuts have loomed over Times staffers since September 8, when Griffin fired publisher Austin Beutner and installed former Baltimore Sun publisher Timothy Ryan in his place. The move was seen by many staffers as a power grab by Griffin, who feared that Beutner was asserting too much control over the paper and was quietly setting the stage for a takeover by Southern California buyers. In late September, Times editor-in-chief Davan Maharaj sent a memo about forthcoming "changes in how we deploy personnel, schedule stories and plan coverage." Despite positive rhetoric about the paper's "evolution," the memo was seen by many staffers as a thinly veiled warning about forthcoming cutbacks. On Monday, in what was described as a sign of the times, one-third of the Times front page was given over to an American Airlines advertisement, leaving room enough for just three news articles.